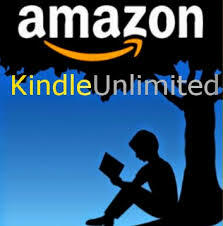 Although I usually sell my books on all major retailers’ platforms, I have decided to give Kindle Unlimited a whirl for a three month trial period. In a nutshell, Kindle Unlimited is a subscription service offered by Amazon that lets you borrow and read as many books, audiobooks, and magazines as you want for $10/month. There are more than one million titles available and many of them are from self-published authors, so if you’re a voracious reader or simply want to support indie authors, this is a great option. I think KU is an awesome service for readers, sort of the ‘Netflix of books’, but it is controversial in publishing circles. When a book is enrolled in KU, it can’t be available for sale or download anywhere else, which creates a monopoly on the title in favour of Amazon. Obviously, other retailers aren’t fond of this. Another common criticism of the program is that KU hurts writers/the publishing industry by devaluing books and making authors too dependent on Amazon for the majority of their revenue. So why have I chosen to enrol in Kindle Unlimited? Simple – other retailers haven’t been offering me much bang for my buck lately. I have tons of respect for everywhere I sell books, especially Kobo (Fury’s Kiss won the $10,000 Kobo Emerging Writer Prize in Romance). However, my sales aren’t what I hoped to see at this point in my career, based on the number of books and short stories I have available to readers. I have tried different marketing strategies, including promotions with specific retailers, Facebook ads, and newsletter building campaigns, among other things. Some work better than others, but they all cost money and KU is a free option I haven’t tried yet. Testing out KU isn’t a case of sour grapes because my books don’t sell as well as I would like – I write and publish because I enjoy it, regardless of whether I make money or not. That being said, I would prefer to enjoy my work and make money at the same time. I also have a number of projects in the works that require significant upfront investment (cover design, editing, formatting, printing costs, etc.). My goal is to make my self-publishing business a growing concern, not just a going concern. For that reason, I need to keep the hustle going so I don’t go broke pumping personal funds into publishing. If you’re interested in outstanding legal and economic analysis of the publishing industry with a side helping of common sense, I suggest http://www.thepassivevoice.com. This blog is written by Passive Guy, aka David P. Vandagriff), an attorney, entrepreneur, former tech executive and writer. His frequent commentary on Amazon’s presence in the publishing/online retail industries align closely with my own views, except that he has the benefit of years more experience than a spring chicken like myself. (If you ever read this, PG, I’m not calling you old. I’m calling myself young). In a competitive economy, no retail organization has a right to continue its existence. Commercial history is littered with names of former commercial giants who lost the contest for consumers’ dollars to competitors who did a better job of providing consumers what they wanted. During their climb to prominence, Montgomery Ward and Sears decimated hundreds of small-town retailers with lower prices and a far larger choice of products.